It’s donut time!! 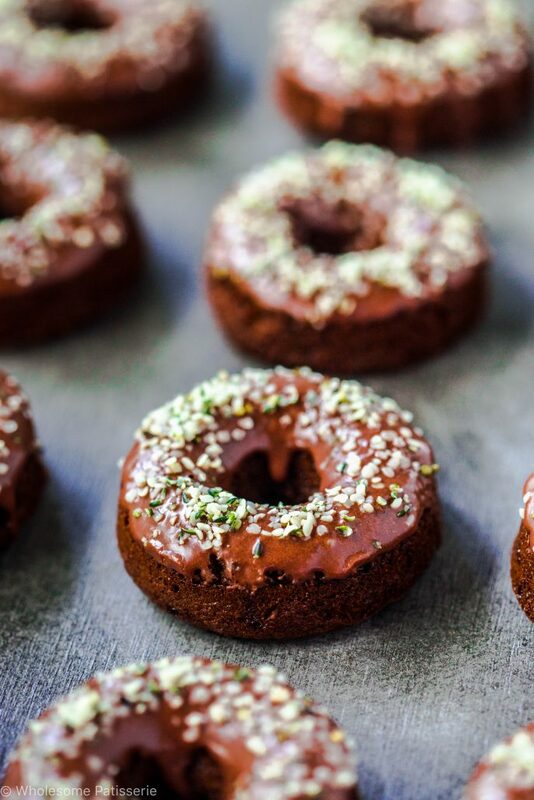 This is my very first donut recipe here on my blog, I know, I can’t even believe it! 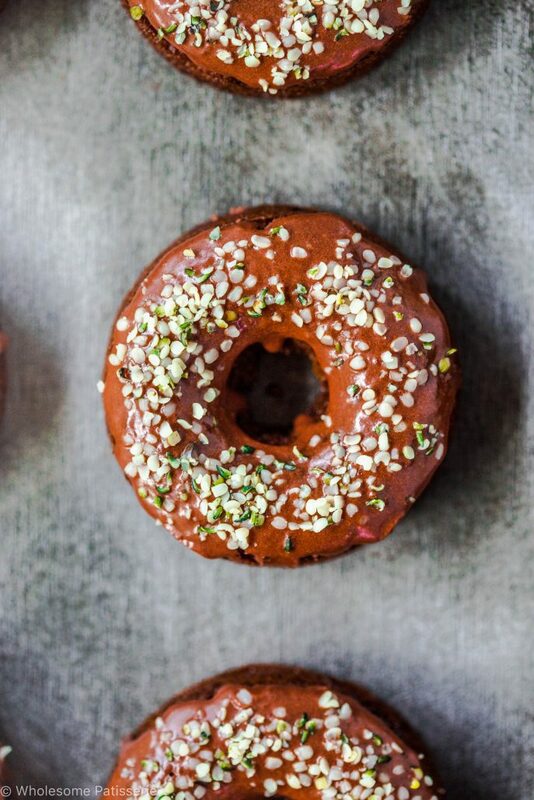 Now this donut recipe is not your usual deep fried yeast donuts. 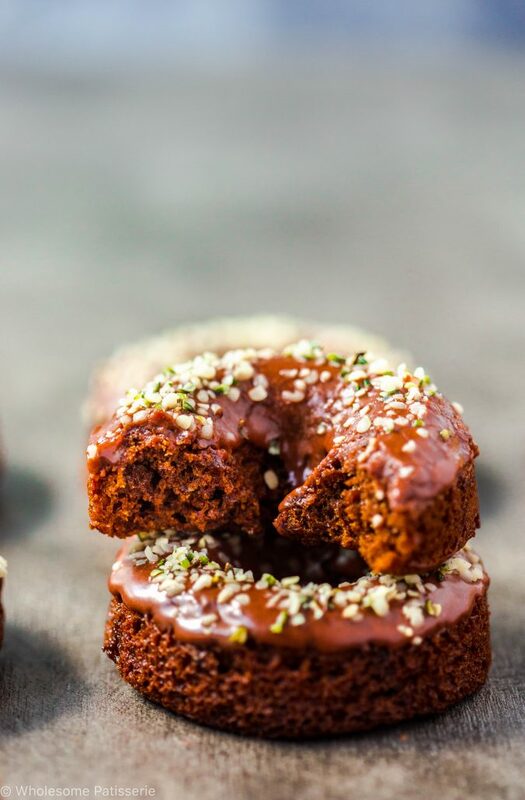 They’re healthier baked donuts with more of a cake batter and texture. 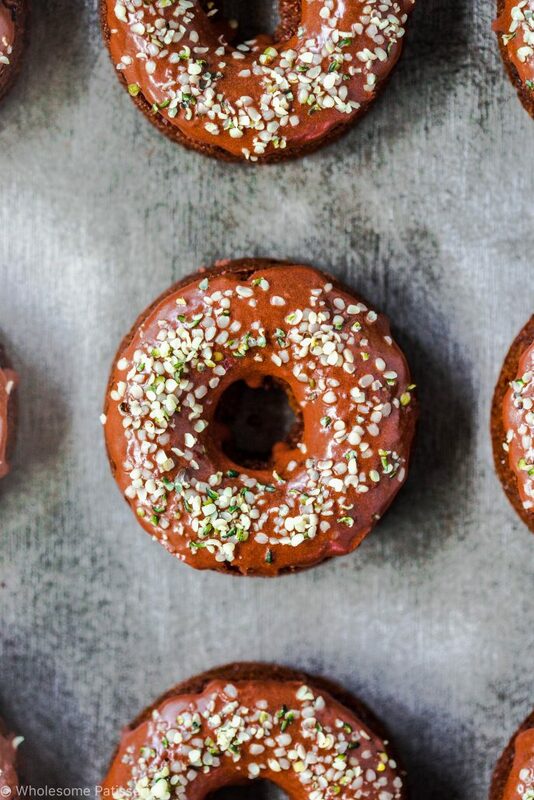 So simple to make that you will have glorious donuts in no time! I’ve just recently started using hemp seeds in my baking and cooking after a long time of not using them. 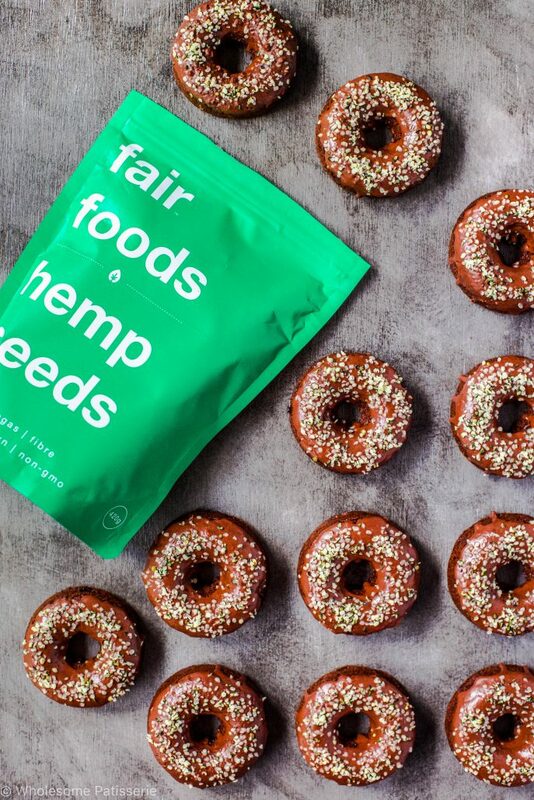 I get my hemp seeds from Fair Foods based here in Australia, loving their local hemp seeds, perfection! That is also what you see on these chocolate donuts. I used hemp seeds as sprinkles! Instead of those nasty sugar filled sprinkles that mostly made from chemical filled colourings too. Since I replaced regular eggs with flax eggs, I’m quite happy with the way the texture of the donuts turned out. They aren’t as high or as fluffy as a cake but that’s not what we are after, well in my opinion. I know those deep fried yeast based donuts are fluffy and airy inside but these baked ones are slightly more dense, reminds me of Krispy Kreme donuts! I don’t eat Krispy Kreme Donuts by the way, I can count on one hand how many of those I have had in my life and it wasn’t pleasant. I felt instantly sick to the stomach after eating one of those chocolate ones with that creamy sugary glaze. That is why making your own donuts is much better for you! I even spelt Krisy Kreme with a C instead of a K, luckily I read that back haha! So what I was saying is that this donut batter is on the thicker side, especially without the use of eggs. I added extra baking soda to help them raise even more! You don’t need to bake these for long either. On that subject, make sure you don’t completely fill the donut molds all the way up, as the batter does raise. I say in the recipe to fill the molds up 2/3 of the way, you still want that hole in the middle of your donuts! What’s your favourite donut flavour? Mine has always been those classic cinnamon sugar donuts, omg yum! 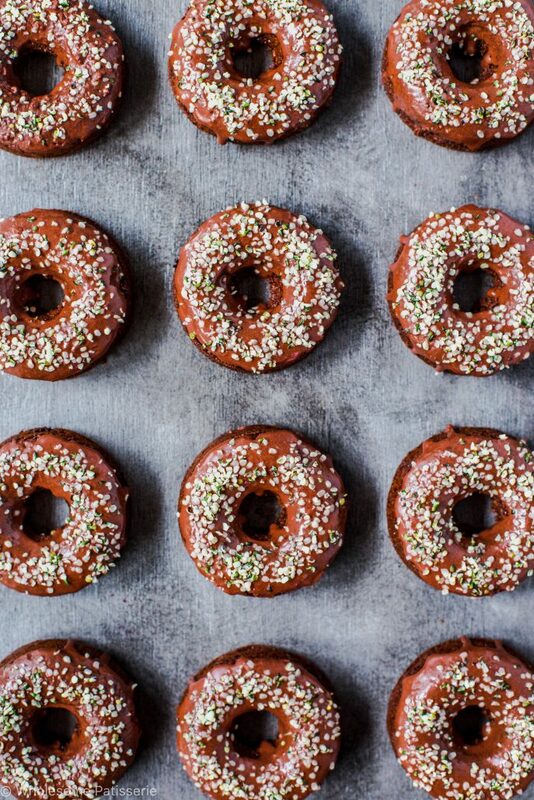 That will be my next donut recipe I think! Enjoy these my friends! Preheat oven to 180ºC (356ºC). 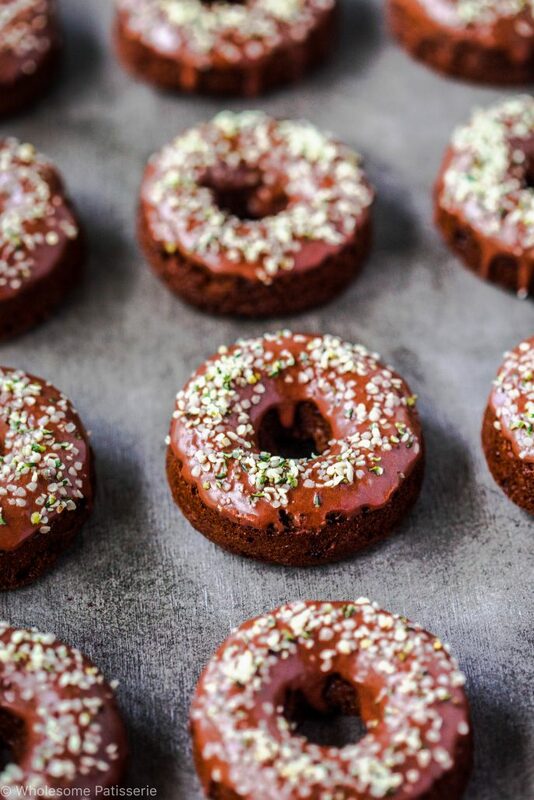 Grease a standard sized donut pan or a mini donut pan with coconut oil, I use a smaller sized pan with 12 donut molds. Set aside. Combined ground flax and water in a small bowl, mix well. Set aside to thicken. Melt coconut oil first then set aside. In a large mixing bowl, combine flour, sugar, cacao, baking powder, baking soda and coffee. Mix well to combine. Pour in milk, vanilla, melted coconut oil and thickened flax egg. Using a hand mixer, beat the mixture until all the ingredients come together. Add more milk if the mixture needs help coming together, 1 tablespoon at a time. Continue to beat of low-medium speed until smooth and thick. You don’t want to over-beat the batter, so stop beating after the batter is just smooth and any lumps have been dissolved. NOTE: You may also use a stand mixer fitted with the paddle attachment on low-medium speed for this step. Spoon batter into a piping bag fitted with a medium sized round nozzle and pipe batter into donut molds, filling ⅔ of the way up the molds. You can also carefully spoon the batter into the donut molds. Bake for 12-15 minutes or until the surface of the donuts springs back when touched. You can also test it with a skewer inserted into the donut, it should come out clean. Cool in pan for 2 minutes. Carefully remove donuts and place on a wire rack. Use a butter knife around the edges to help remove them. While the donuts are cooling, make the icing. In a medium sized bowl, combine icing sugar and cacao powder. Gradually add the water, mixing well after each addition until the icing is smooth and thick. Keeping adding more water until you reach a thick icing consistency. Dip each donut into the icing, letting any excess drip back into the bowl. Place on wire rack to set slightly. 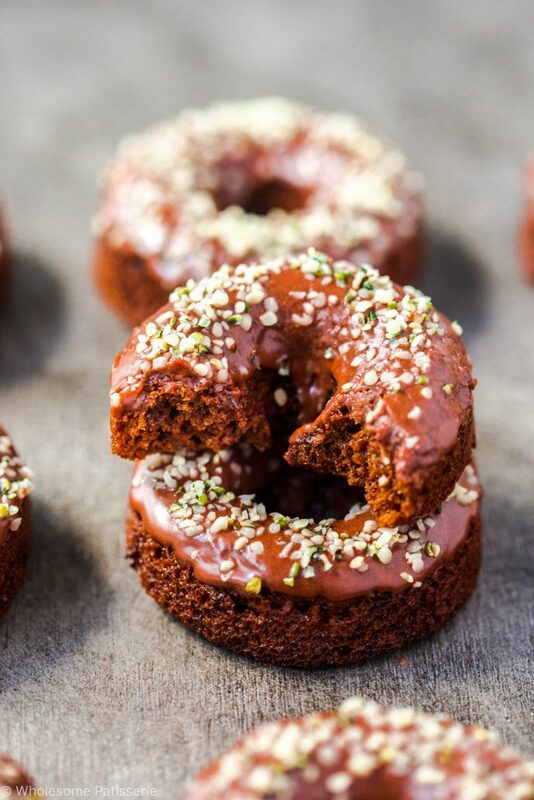 Sprinkle hemp seeds over the icing. Store in an airtight container, in the pantry or refrigerated, for 2-3 days. Ensure not to over-beat the batter. You want the donuts to be as light and fluffy as possible.